"One Nation Indivisible" - Chapter Two: "World-Leader Pretend"
It is a time of observation and revelation on New Earth 2. Hawkgirl is observing the Amazons in their new domain. Batman and Red Arrow investigate radioactive power cells in Gotham City. Worldwatch is monitoring the situation between Erebus and Ark Home, and Red Tornado is looking within for her own humanity while writing the constitution for the planet. All this occurs as the shadow of conflict looms over the world. New Earth 2 and its heroes may very well be scarred forever if battle soaks the lands with blood. As Fury tells Hawkgirl that the Amazons replaced those who died in the colonization of New Earth 2, Power Girl and Green Lantern fight more genetically engineered monsters who were placed there by some unknown party. Meanwhile, Erebus and Ark Home have officially declared war. Over what is unclear for Val-Zod has discovered that the planet on which everyone lives - the same one created by Brainiac's convergence - has no natural resources whatsoever. It seems that long term living was not meant to be on this world. To top things off, the Amazons wish to govern New Earth 2, and they may be intent on fighting to the death in order to do so. Situations have reached a breaking point. It's just a matter of time before things get so out of hand that even the powers of Superman, Green Lantern and the rest of the superhero community may not be able to rescue their new home from Armageddon. Story - 5: Dan Abnett has done it again. He's written a story that is well worth the book's cover price. If I'm going to pay three bucks for a comic, I expect the content to be worth what I paid for it. Sadly, there are some comics that just can't justify giving the shops twelve quarters for such poor quality on the comic pages. Fortunately, Earth 2: Society, after its rough start. Is finally coming around to being the great title it should be. If DC is smart, they will keep Abnett on the book for a long time. He's worked miracles on Earth 2. Art - 5: Jorge Jimenez is a great artist. However, it feels like his style has greatly improved since Dan Abnett took over as writer on this title. Perhaps Abnett is bringing out the best in Jimenez. It certainly shows with page after page of incredible visuals from start to finish in this issue. 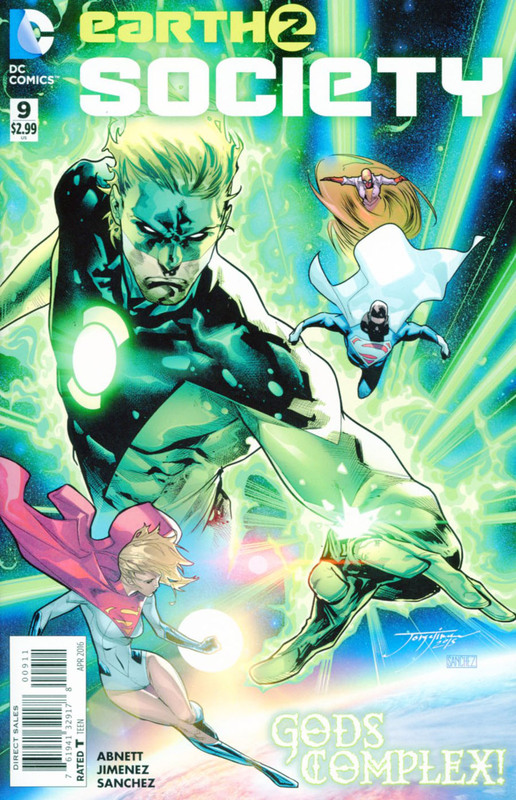 Cover Art - 5: The image conveys a sense of what's going on in this issue without giving too much away. As result, buyers can be curious about the content of the book, which is what every great cover should do.